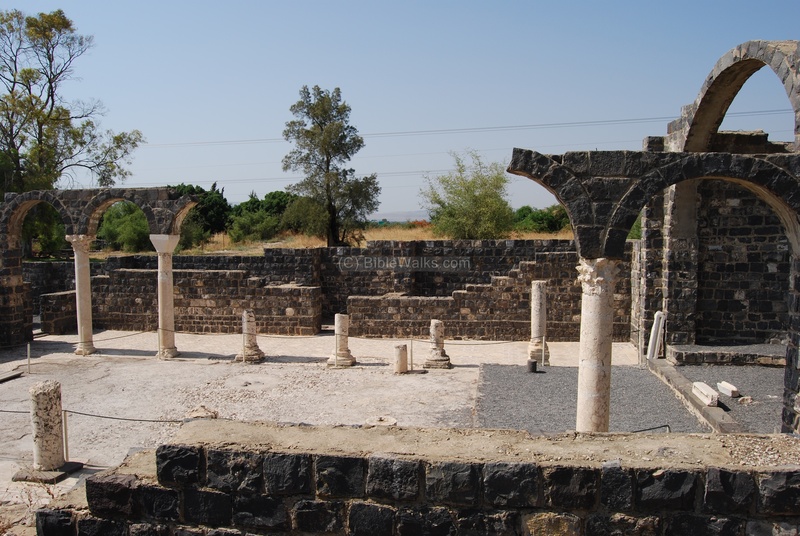 Ruins of a 5th CenturyAD church and monastery at the traditional location of Jesus miracle at Gadarenes/Gergesa - healing the madman, driving out his devils into a herd of pigs who then drown in the lake. Mark 5: 13: "And the unclean spirits went out, and entered into the swine: and the herd ran violently down a steep place into the sea..."
The Gospels tells how Jesus heals the madman, after sailing across the Sea of Galilee and landing in the Country of Gadarenes (Gader, south east corner of the lake). He drives out the devils into a herd of swine, who "ran violently down a steep place into the sea and were choked in the sea". 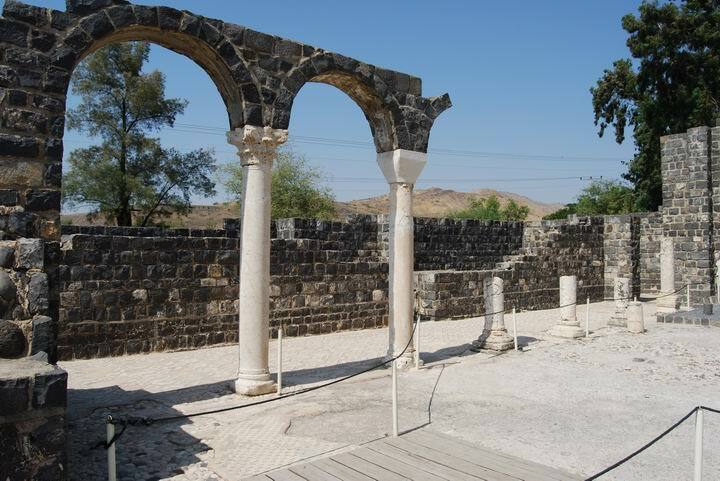 At Kursi, excavations restored the ruins of a 5th-6th Century AD church and monastery, the largest Byzantine monastery in Israel, which was established on basis of the traditional site of the miracle. Kursi is located 500M east from the shores of the Sea of Galilee, on the foothills of the Golan heights, 200M under the sea level. 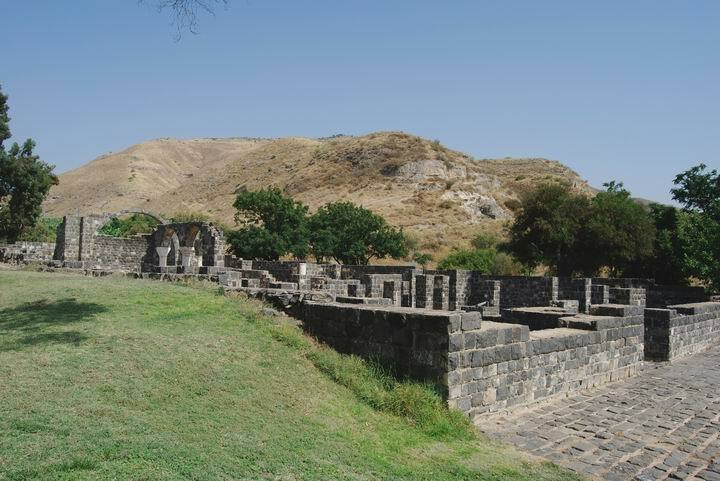 It is facing Magdala which is located across the lake, about 12KM to the west. The site is on the south bank of the Samach creek, about 5KM north to Ein-Gev. 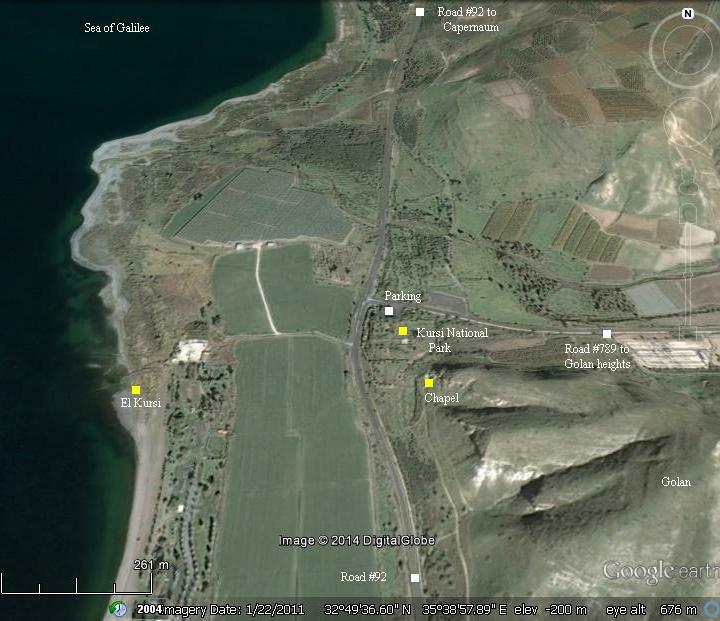 It is near the junction of two roads - the peripheral coastal road #92 (north/south) and a road that climbs eastwards (#789) , up the steep hills of the Golan heights via Givat-Yoav. The description of the site of the miracle fits the location of Kursi: It is located on the east side of the Sea of Galilee - on the "other side" where Jesus sailed from. 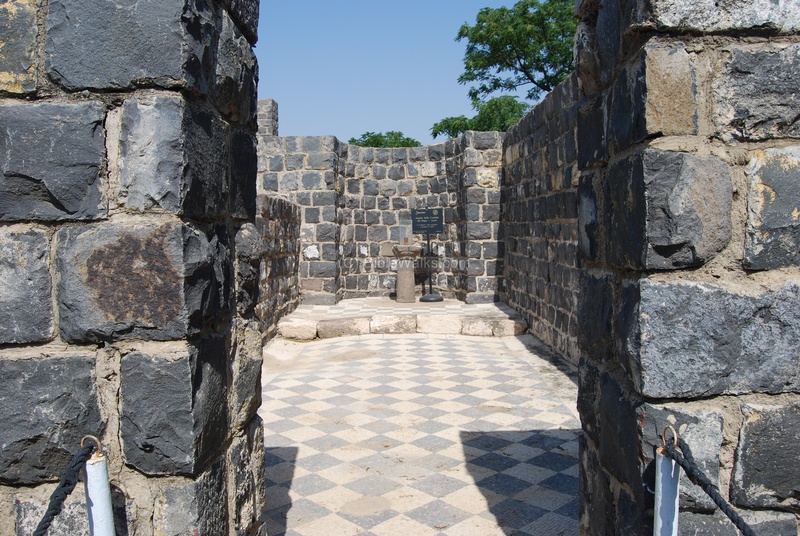 According to the Christian tradition, Kursi is identified as Gergesa (Gergesenes). 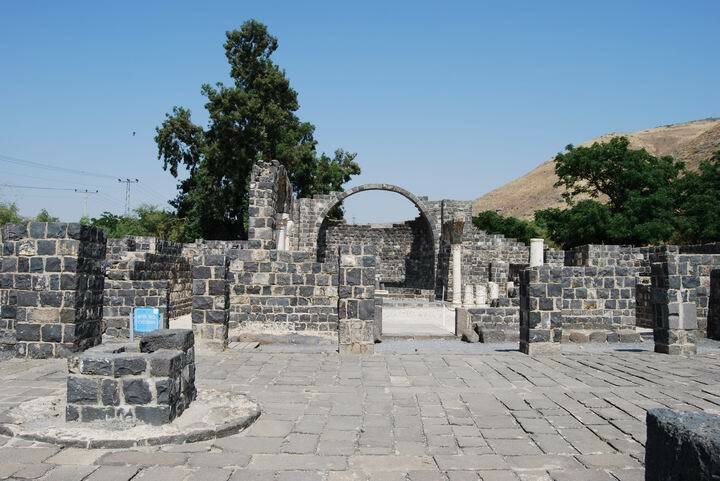 In the Hebrew Talmud there is a town called Kurshi, and names a scholar (Rabbi Jacob Ben Kurshi) that came from this town and was a member of the Sanhendrin in Usha (about 70 years later). Another Talmud text lists towns with pagan worships, and includes Kursi as a gentile town at the times of Jesus. This makes sense, since the pigs were raised on a non-Jewish farm, since their meat is forbidden for Jews. 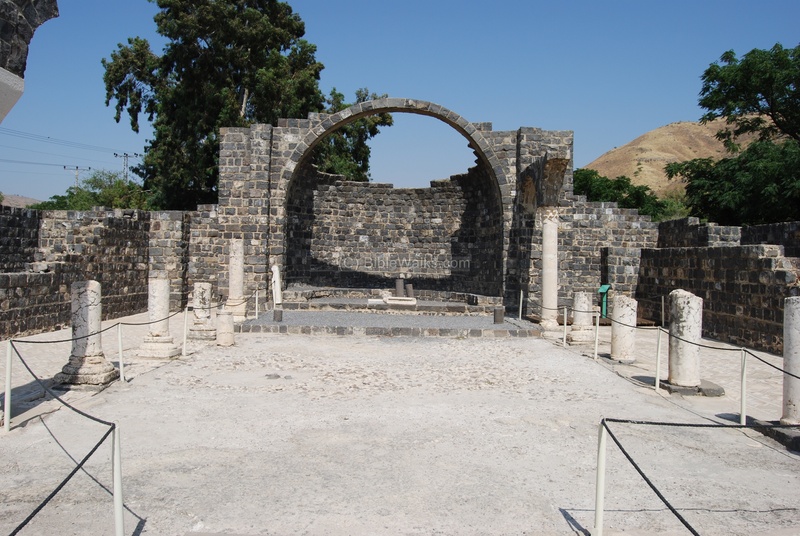 And Decapolis, where Kursi is located, was populated by Gentiles in the times of Jesus. The Arabic name for the ruins is Kursy, meaning: seat or chair. This name may have come from Kursa - a seat in Hebrew, based on an Aramaic word. Another candidate for the location of this event may be found in Hippos, 5KM to the south. The site was established in the middle of the 5th Century AD. The monastery was built on a large area (145 x 123M) and was protected by walls. According to some text (Cyrillus Scythopolis; "Vita Saae") the "father" of Israeli monks, Mar Saba, prayed here in 491AD with his fellow monks, on a tour of the Sea of Galilee. 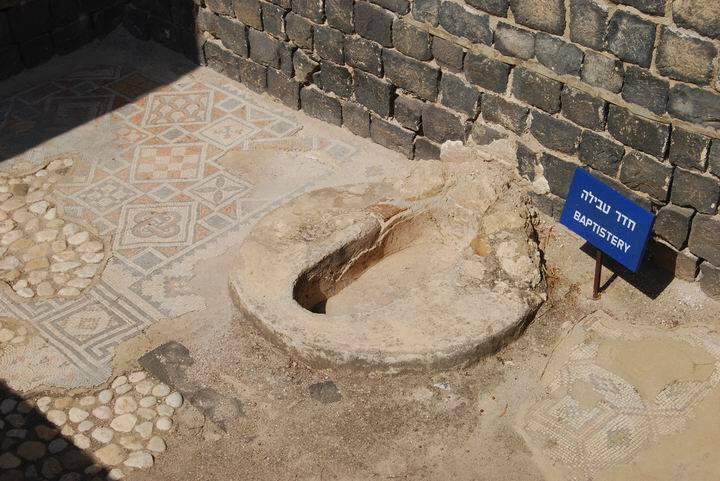 The baptistery near the chapel was added in the 6th C.
The Persians defeated the Byzantine rulers in 614 AD. The conquerors were assisted by the Jewish population in the Galilee, who seized the moment to reestablish an independent state. During the Persian invasion the site was severely damaged, and the monks were murdered. In the excavations of 2002, the archaeologists found Persian weapons in the monastery. 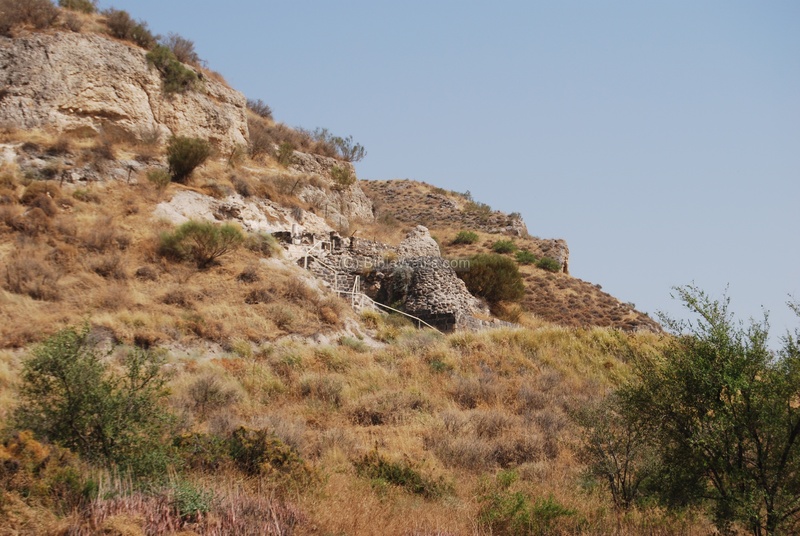 This may have been the first Christian site damaged by the Persians in their bloody conquest of the Holy Land, which lasted for a brief time until the Byzantines recaptured the land. The Umayyad Caliphate Arabs captured the land in 636, and allowed the Christians to continue to worshiop and live in Kursi. The monastery was restored. In the 8th C AD the monastery was damaged by the great earthquake (749), never to be used again as a place of worship. 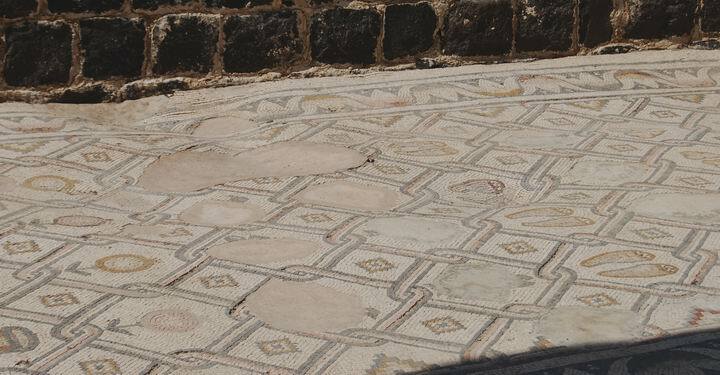 During the 9th C the place was reused for residential and storage by local Arabs, and the mosaics may have been damaged at that time (erasing the figures on the magnificent floor). 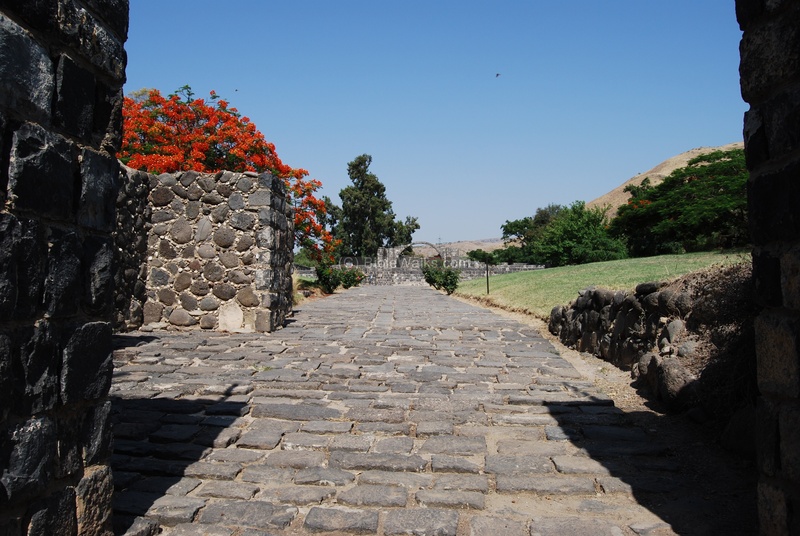 In 1970 the road works accidentally revealed the walls of the monastery, which started an archaeological expedition. It was headed by V. Tsaferis and D. Urman, on behalf of the Department of Antiquities. The excavations restored the ruins, and unearthed the chapel on the hill. The site was opened to the public in 1982 as a National park. In recent years the excavations continued: in 2001-2002 a bath complex was found in the north part of the site, with cold and hot pools. 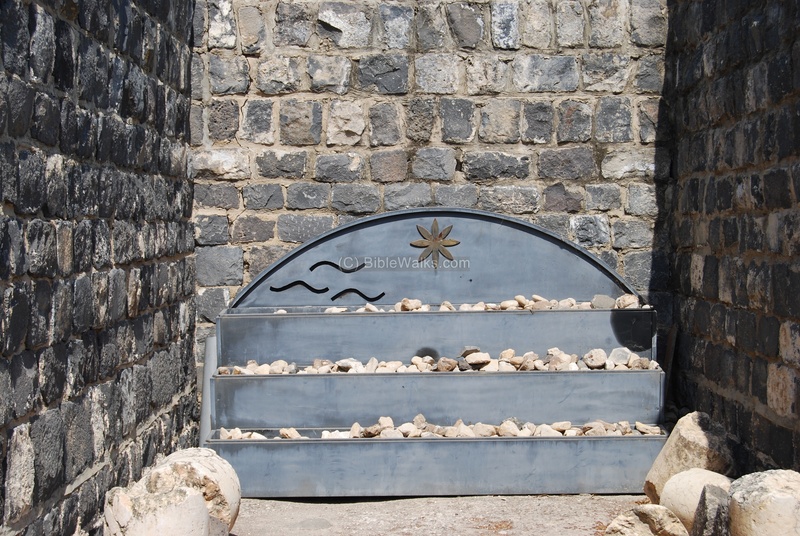 The excavation was under the direction of Dr. V. Tsaferis (IAA) and Dr. C. Page (Jerusalem Center for Biblical Studies). This large 100 square meters complex served the thousands of Christian pilgrims who came to the monastery to witness the site of the miracle. 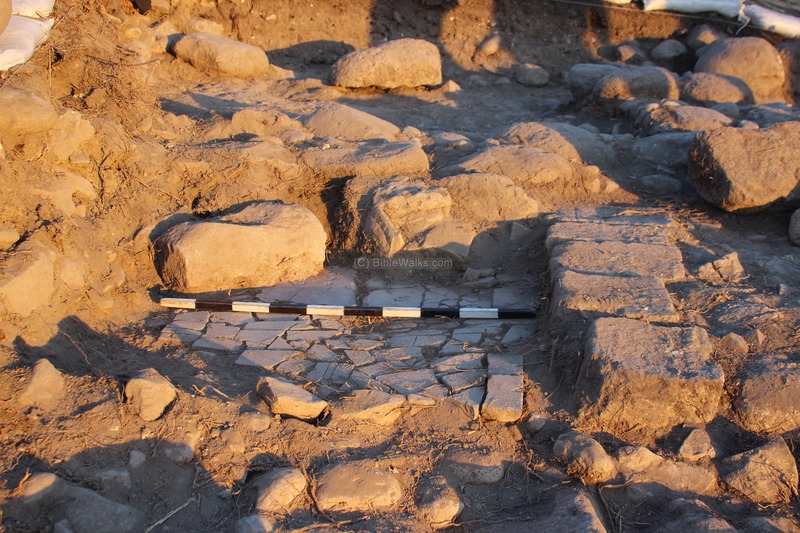 The bath house, dated to the 5th-7th Century, is unique - it is the only one found so far inside a monastery. Therefore, the monastery served also as a guest house, offering additional services to the pilgrims. An aerial view, as captured from a quad copter from the north side, is seen in this photo. A legend of the major points of interest is marked on the aerial view below. The Basilica is seen in the center of the picture, facing the east. Behind, on the cliff, is a hillside chapel. 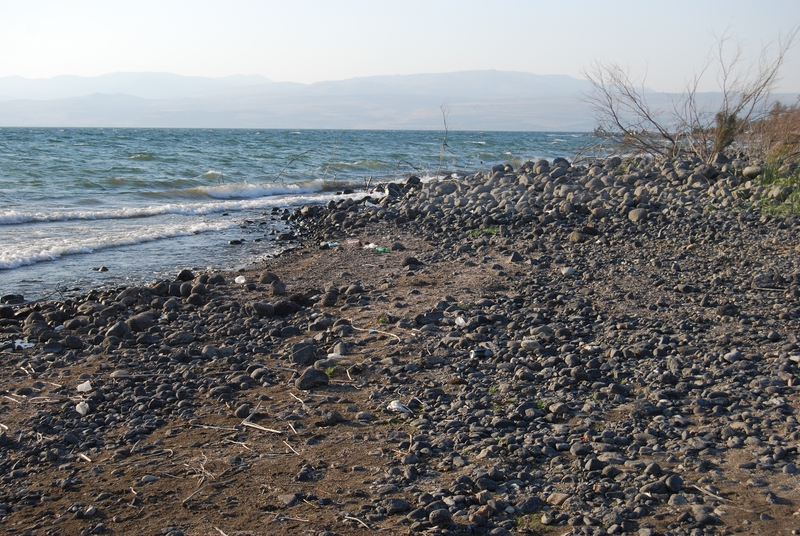 The Sea of Galilee is seen on the far right background. Ruins of the residential area of the Monastery is on the front (north) side. A bath house complex was found in renewed excavations of 2002 in the lower center right side (Thanks to K. Stammerman for the update). You can press on the squares to branch to that location. View of Kursi from the west side, with the church at the background. Another view of the complex, from the north-west side. The south hills - the foothills of the Golan heights - are seen in the background. The entrance to the church was once protected by a 2-story tower. After entering into the atrium - the front yard of the complex - a well is seen on the left side. 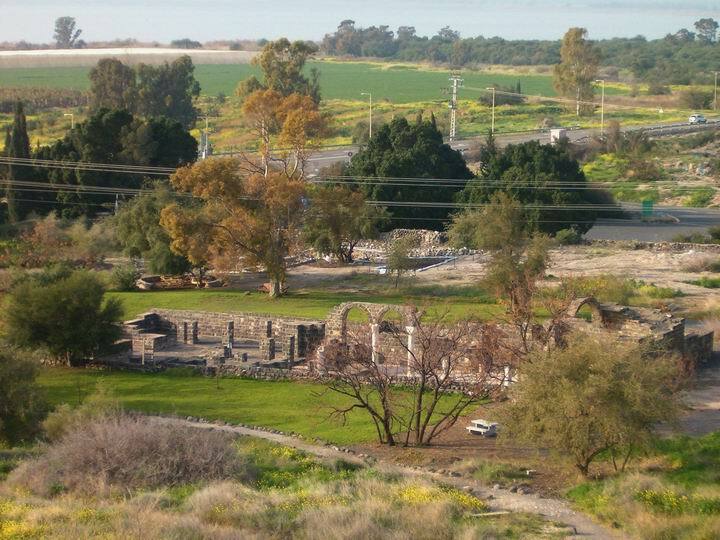 The church is seen behind the center of the yard, and on the right background are the south hills of the Golan heights. Another view of the atrium, looking towards north-east. The east side of the basilica is the central apse - where the main altar used to be. On the west side of the basilica, seen in the foreground in the photo below, is a large prayer room, flanked by 6 marble columns on both sides, and two sets of aisles behind the colonnade. The view of the north aisle of the basilica. The view of the south aisle, with the arch over the main altar on the east side. Another view of the prayer room, the colonnade and the north aisle. 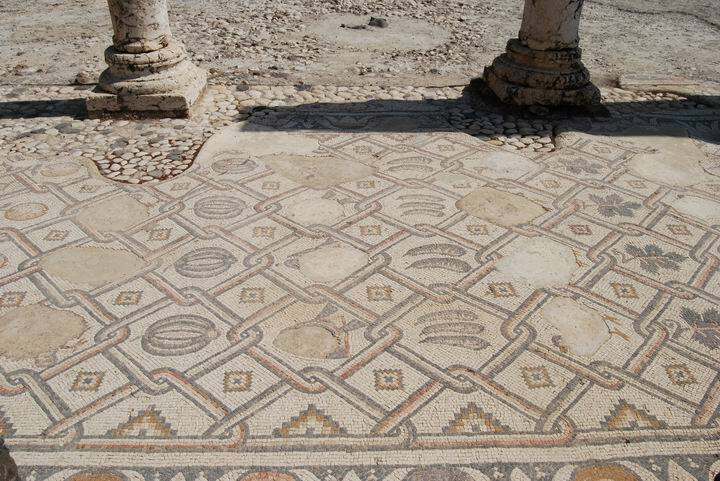 The mosaic floor on the north aisle, decorated with birds and fish, and pictures of plants such as dates, citrons, grapes and pomegranates. The birds and fish were vandalized, probably by its later residents. The mosaic floor on the south aisle, with the same patterns as on the other side. On the south side of the basilica is a chapel. Below the floor was the crypt, its entrance covered by a lid on the floor at the entrance to the chapel, and inside where 30 male skeletons of the resident monks. A close up of the chapel is seen below. On the south side of the main altar is a pastophoria room (in Byzantine churches - rooms to the south and north of the main altar; used by clergy). This room, same as its identical twin room on the south, was entered through the aisles of the basilica, although originally there was an access from the altar. It was converted to a baptistery room at a later stage (6th C AD), was modified and covered by mosaics on one side, and added an oval shaped baptismal (1M x 1.5M). A 9-line Greek inscription, dated to 582-7AD, refers to the laying of the mosaic floor in the baptistery. 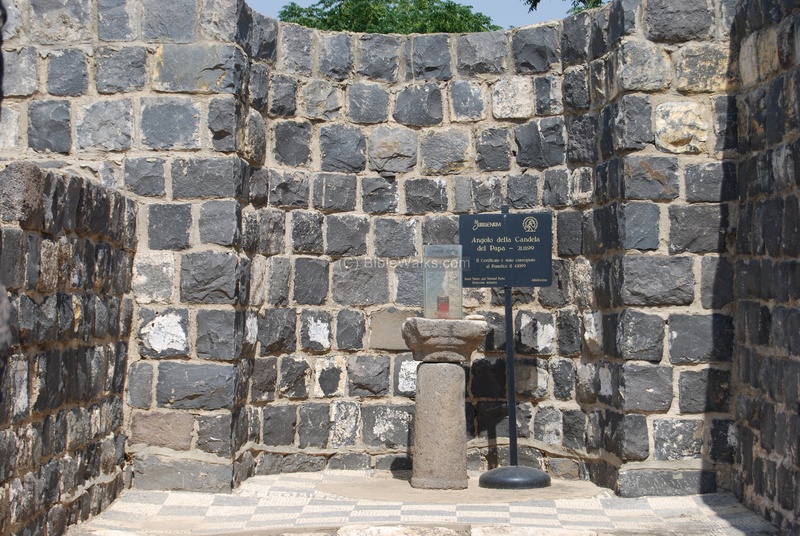 According to A. Ovadiah's article, this addition of the baptistery at a later stage was a common change in 5 churches out of the 11 that were surveyed in Israel, including Cappernaum. It happened in the same time, probably "linked to growing number of people being baptized as part of their conversion to Christianity during the 6th C AD", or due to space constraints or economic reasons. 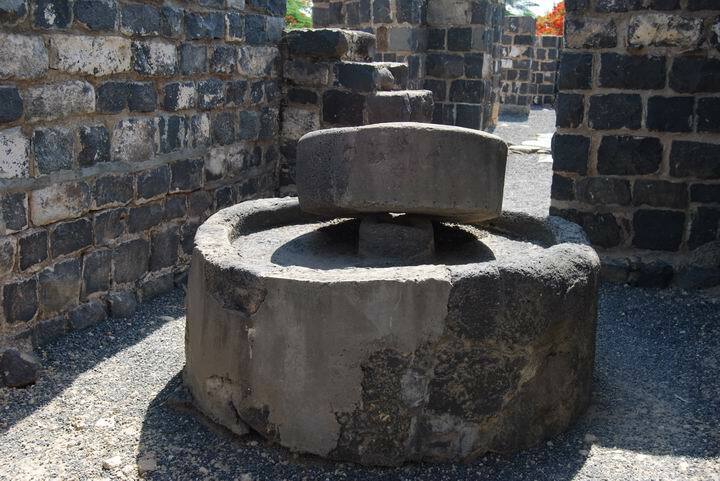 In the north side of the basilica is a set of oil presses, in an area of 6.4M x 2.6M. The photo below shows a crushing stone and basin where the olives were placed and crushed as the first step in the process of olive oil production. 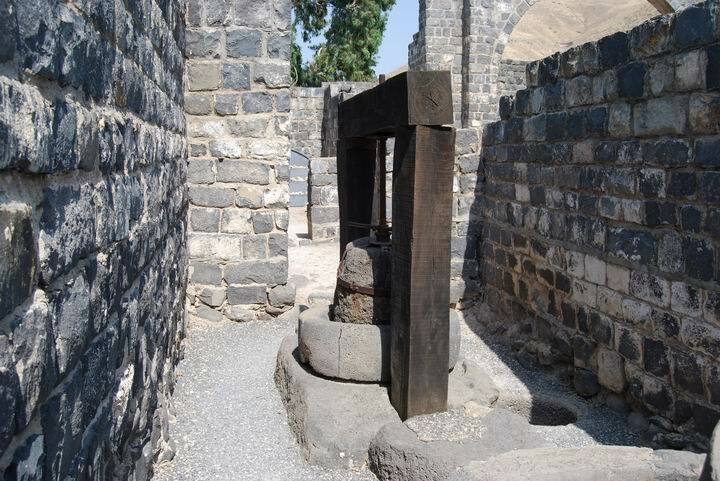 Oil production was a major source of income in the Roman period: In the area of the Golan heights alone, 109 oil presses were found in 58 ancient sites (ref: Atiqot XXXIV). The second step in the process involved pressing the crushed olives. This was performed with the oil press, which is a direct-pressure screw type. The north room, behind the oil press, has a stand where candles are lit. Behind it is the north pastophoria room, identical to the south one, which was entered through the aisles of the basilica. On the south side is a section that is built into the hillside, overlooking the monastery. Here is another chapel, which has a floor of 3 layers of mosaics. Its apse is embedded in the cave. 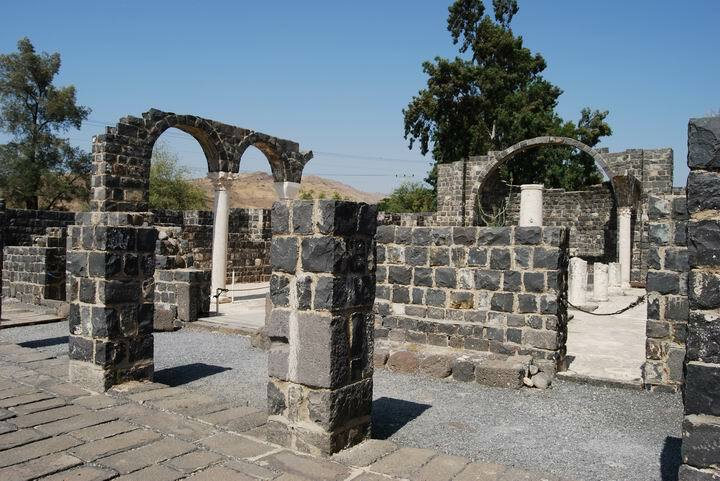 In the chapel was an unidentified inscription, columns, and a stone bench for a panorama of the Sea of Galilee. It is seen below. A close-up of the chapel. 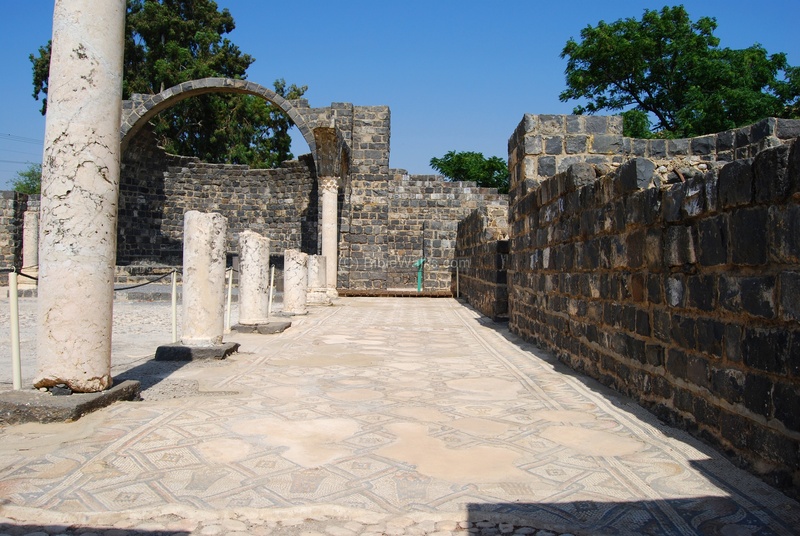 According to a tradition, the chapel marks the place where the madman (or madmen) revealed himself (Luke 8,27: "...And when he went forth to land, there met him out of the city a certain man, which had devils long time, and ware no clothes, neither abode in any house, but in the tombs..."). From the hill is a great view of the Monastery, as seen in the photo below, and of the Sea of Galilee. In the north side of the Monastery are the excavated ruins of residential section, where the community of monks and the guests lived beside the church. In the area are houses, yards, and installations. 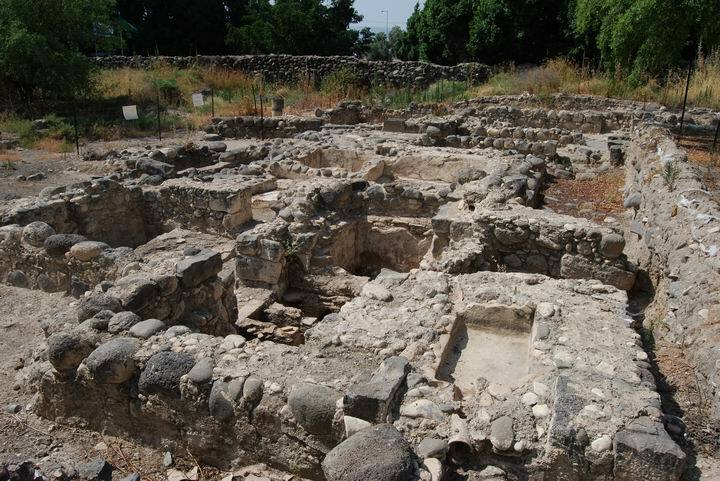 A bath house complex was unearthed here, which served the Christian pilgims. This photo shows the lake side of Kursi. 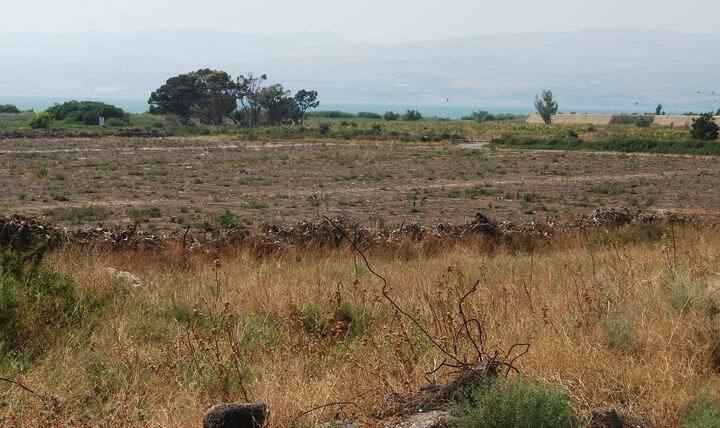 In the background is the Sea of Galilee, with Magdala on the other side (12KM across the sea/lake). On the shore is an ancient site (El-Kursi) where the remains of the old port of Kursi are located in the water and on the shore. 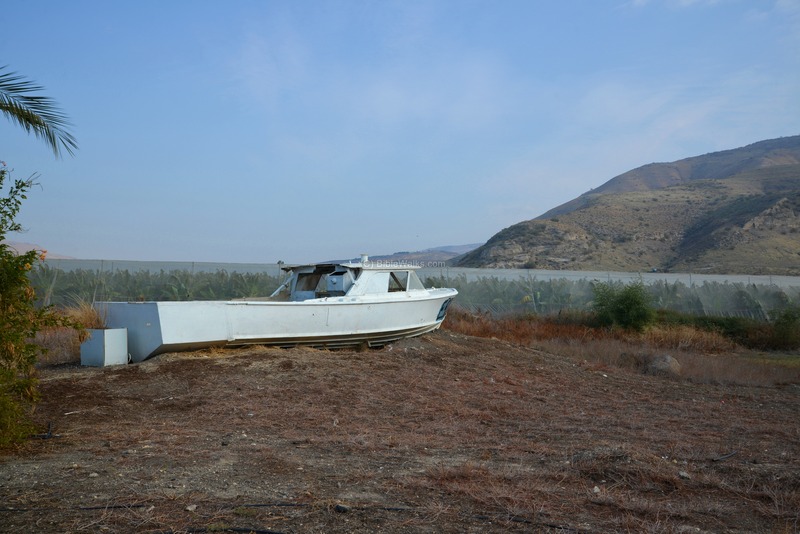 This might have been where Jesus has disembarked when he arrived to this shore (Luke 8: 26: "And they arrived at the country of the Gadarenes, which is over against Galilee. And when he went forth to land..."). The ruins of the ancient fishermen village is mostly covered by bush. 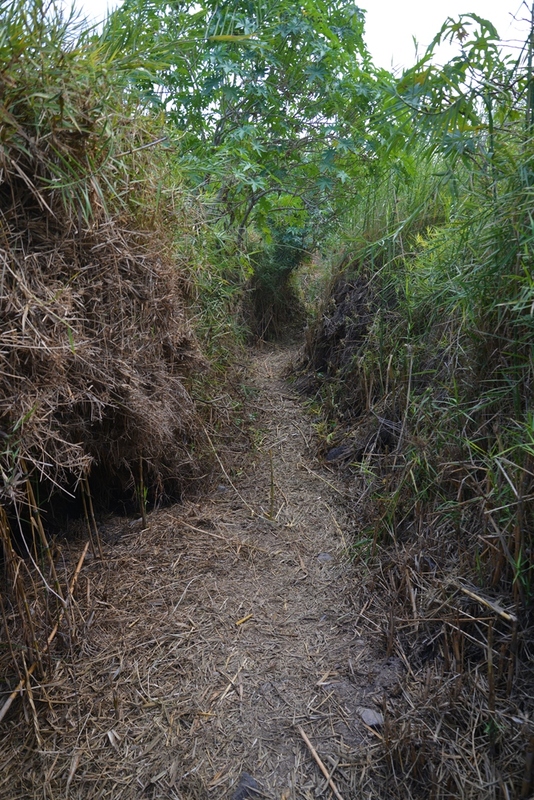 A trail cut through the canes allows an exciting passage along the beach. 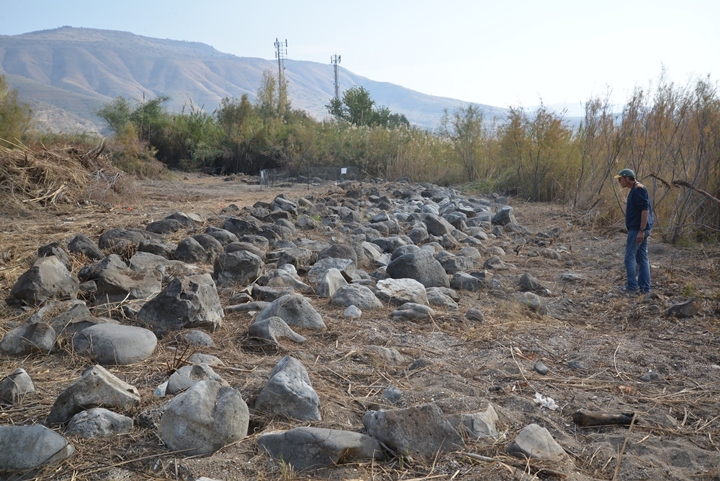 The excavations of the ancient harbour site were possible due to the dry winter of 2015, when the water level of the lake dropped to a record low. In the photo below is the view of the breakwater with the excavation site in the background. 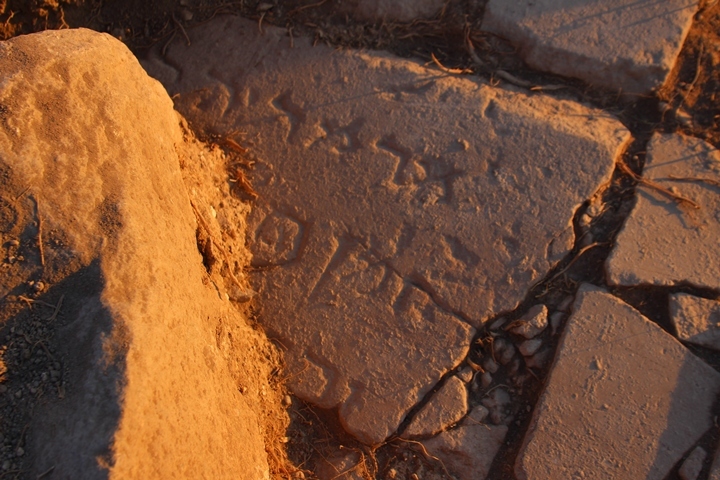 The excavations at the harbour site have uncovered in December 2015 an important inscription in Hebrew and Aramaic letters. (Inscription Photos: courtesy of Jennifer Munro). Seven lines were engraved on a large (140 cm by 70 cm) marble slab, and were dated to the 5th/6th Century AD. According to an initial deciphering of the inscription, it includes the words ‘marmaria’, (son/Mr of Mary) and ‘The Merciful’. 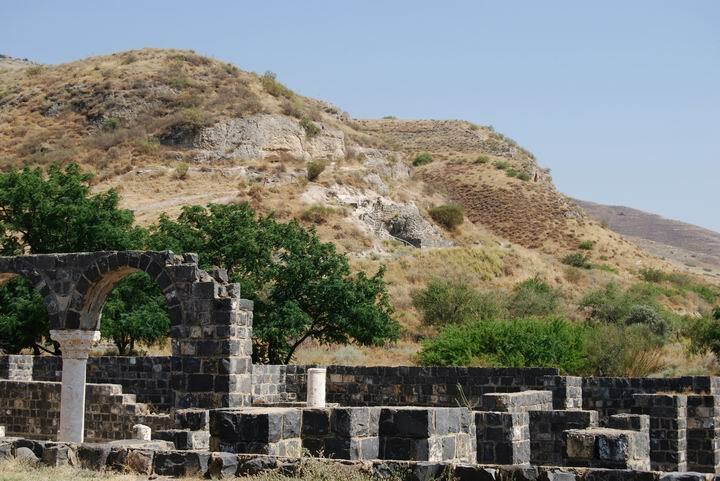 This finding may suggest that the city at Kursi, in the “Land of the Gederenes", was Jewish at the time of Jesus. These texts describe the miracle of the exorcism of the demons into the herd of swine. "And when he was come to the other side into the country of the Gergesenes, there met him two possessed with devils, coming out of the tombs, exceeding fierce, so that no man might pass by that way. And, behold, they cried out, saying, What have we to do with thee, Jesus, thou Son of God? art thou come hither to torment us before the time? And there was a good way off from them an herd of many swine feeding. So the devils besought him, saying, If thou cast us out, suffer us to go away into the herd of swine. And he said unto them, Go. And when they were come out, they went into the herd of swine: and, behold, the whole herd of swine ran violently down a steep place into the sea, and perished in the waters. And they that kept them fled, and went their ways into the city, and told every thing, and what was befallen to the possessed of the devils. And, behold, the whole city came out to meet Jesus: and when they saw him, they besought him that he would depart out of their coasts". But when he saw Jesus afar off, he ran and worshipped him, And cried with a loud voice, and said, What have I to do with thee, Jesus, thou Son of the most high God? I adjure thee by God, that thou torment me not. For he said unto him, Come out of the man, thou unclean spirit. And he asked him, What is thy name? And he answered, saying, My name is Legion: for we are many. And he besought him much that he would not send them away out of the country. Now there was there nigh unto the mountains a great herd of swine feeding. And all the devils besought him, saying, Send us into the swine, that we may enter into them. And forthwith Jesus gave them leave. And the unclean spirits went out, and entered into the swine: and the herd ran violently down a steep place into the sea, (they were about two thousand;) and were choked in the sea. And they that fed the swine fled, and told it in the city, and in the country. And they went out to see what it was that was done". "And they arrived at the country of the Gadarenes, which is over against Galilee. And when he went forth to land, there met him out of the city a certain man, which had devils long time, and ware no clothes, neither abode in any house, but in the tombs. When he saw Jesus, he cried out, and fell down before him, and with a loud voice said, What have I to do with thee, Jesus, thou Son of God most high? I beseech thee, torment me not. For he had commanded the unclean spirit to come out of the man. For oftentimes it had caught him: and he was kept bound with chains and in fetters; and he brake the bands, and was driven of the devil into the wilderness. And Jesus asked him, saying, What is thy name? And he said, Legion: because many devils were entered into him. And they besought him that he would not command them to go out into the deep. And there was there an herd of many swine feeding on the mountain: and they besought him that he would suffer them to enter into them. And he suffered them. Then went the devils out of the man, and entered into the swine: and the herd ran violently down a steep place into the lake, and were choked. When they that fed them saw what was done, they fled, and went and told it in the city and in the country. Then they went out to see what was done; and came to Jesus, and found the man, out of whom the devils were departed, sitting at the feet of Jesus, clothed, and in his right mind: and they were afraid. They also which saw it told them by what means he that was possessed of the devils was healed. Then the whole multitude of the country of the Gadarenes round about besought him to depart from them; for they were taken with great fear: and he went up into the ship, and returned back again". Kursy - The Arabic name of the ruins, meaning seat or chair. It may have come from Kursa - a seat in Hebrew, based on an Aramaic word. Gader - fence in Hebrew. The source of the name of the greeting city: Gadarenes.